UC San Diego's Data Science/Machine Learning Platform (DSMLP) provides undergraduate and graduate students with access to research-class CPU/GPU resources for coursework, formal independent study, and student projects. Visit https://datahub.ucsd.edu to sign on to DSMLP. Built and operated by IT Services (ITS), with additional financial contributions from Cognitive Science and Jacobs School of Engineering, DSMLP leverages Qualcomm Institute's current research into cost-effective machine-learning cyberinfrastructure using Kubernetes and Docker container technologies. 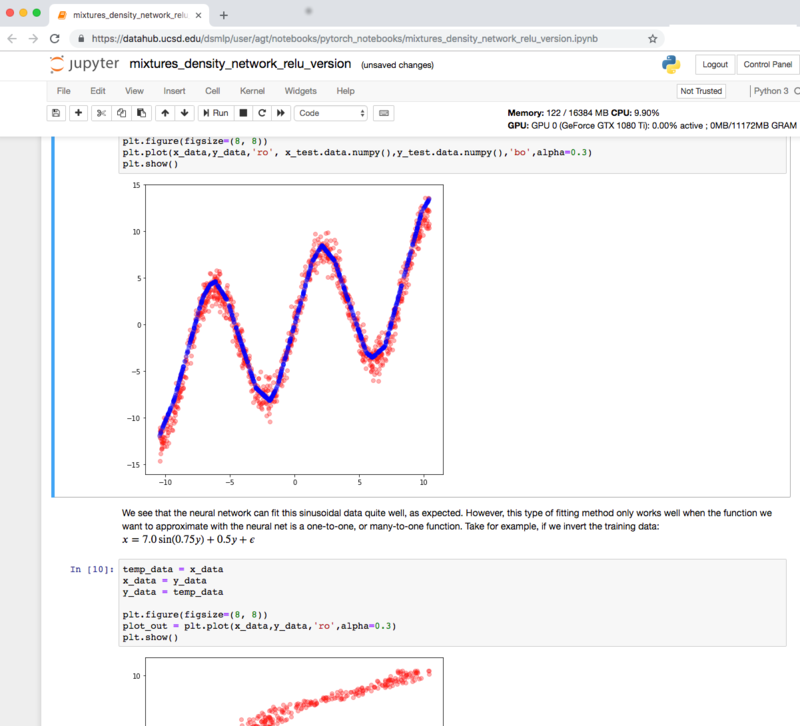 Web-based Jupyter notebooks allow students to combine live code, equations, visualizations and narrative text for data cleaning and transformation, numerical simulation, statistical modeling, data visualization, machine learning, and more. DSMLP's Jupyter notebooks offer straightforward interactive access to popular languages and GPU-enabled frameworks such as Python, R, Pandas, PyTorch, TensorFlow, Keras, NLTK, and AllenNLP. Complex ML workflows are supported through terminal/SSH logins, background batch jobs, and a full Linux/Ubuntu CUDA development suite. 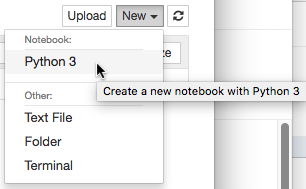 Users may install additional library packages (e.g. conda/pip, CRAN) as needed, or can opt to replace the default environment entirely by launching their own custom Docker containers. High-speed cluster-local storage houses student workspaces, course files, and common training corpora (e.g. CIFAR, ImageNet). ITS/Educational Technology Services (ETS) consultants are available to assist with course-related software and container configuration, assignment distribution/collection, and staging of course-specific datasets. To request computing support for undergraduate and graduate-level courses, visit: cinfo.ucsd.edu. By automatic setup of courses assigned to DSMLP: enrolled students receive access shortly before the first day of each term. Upon request, for students interested in exploring the environment for personal enrichment: please send email to ets-consult@ucsd.edu. Instructors and instructional support staff may request personal DSMLP access in order to support their students' use of the platform, or to explore and evaluate the environment for course development purposes. To request an account, please email request to ets-consult@ucsd.edu. To request computing support for your undergraduate and graduate-level courses, visit: cinfo.ucsd.edu. Please note that DSMLP is limited to student-focused activities. Research IT Services can help identify comparable GPU compute environments for your non-student research needs. Due to funding restrictions, DSMLP resources are not currently available to self-supported professional degree programs' coursework or capstone projects. Sign on with your UC San Diego Google account and password. Please see: User Guide: Data Science/Machine Learning Platform. Please use the DSMLP Independent Study Access Request Form to outline the scope of your project and describe its computational needs. If you are requesting resources as part of a team, only one member need submit a form. Due to state funding restrictions, DSMLP cannot be used for self-supported professional degree programs' coursework or capstone projects. *Please see the next section, "Special considerations for Doctoral research", for additional information regarding use of DSMLP for dissertation research. ETS is happy to support dissertation-related independent study via our instructional computing resources. Access to DSMLP is limited to currently-registered UC San Diego students, which may impede collaboration with UC San Diego faculty, staff researchers, postdoctoral students, or with individuals at other institutions. Continuity of research may be impacted should responsibilities shift within your project or group. Student research jobs run at a lower priority than coursework, and resource contention is to be expected during busy 8th-10th week and final exam periods. We cannot raise priority of research jobs to accommodate publication deadlines. DSLMP resources are provided "as is"; we are unable to modify them to support specific project needs (e.g. custom hardware or software versions). We will however provide you guidance in configuring the environment for your work. Finally, DSMLP's capabilities are relatively modest compared to those available via San Diego Supercomputer Center (SDSC), NSF/national HPC resources such as XSEDE, and cloud-based services such as Amazon AWS, and may not accommodate natural growth in a project's resource needs over time. Larger requests, or projects requiring capabilities outside of ETS' instructional portfolio, will be routed to campus Research IT Services facilitators, who can evaluate the project's broader context, including the related efforts of your PI and research group, and then help you identify the most appropriate resources. To report problems with DSMLP, or to request assistance, please contact the ITS Service Desk.